UK Radio Scanning Forum • View topic - TETRA signals at 411.9 and 421.9 ? 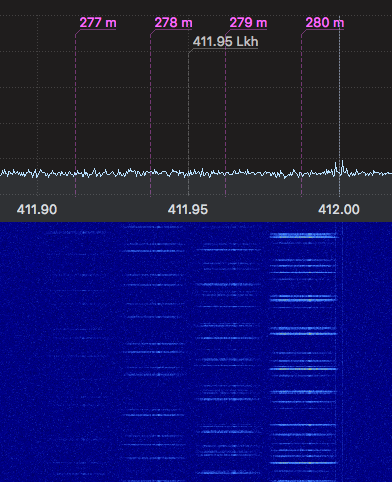 TETRA signals at 411.9 and 421.9 ? Anyone know what the TETRA-like data burst at 411.9 and 421.9 are? They appear to be a constant stream of data bursts, rather than voice comms. They seem to be on Airwave extended channels 276 to 280, both base/downlink and mobile/uplink frequencies. These are in the Birmingham area, but I've never been able to track them down, not least because scanners are not good at detecting TETRA signals. Unlike most Airwve extended transmissions these are clearly not restricted to London. Do they exist in London too? Do they occur elsewhere in the country? I reserve the right to ignore people who have made no attempt to the read the manual, and expect others to do it for them. Re: TETRA signals at 411.9 and 421.9 ? 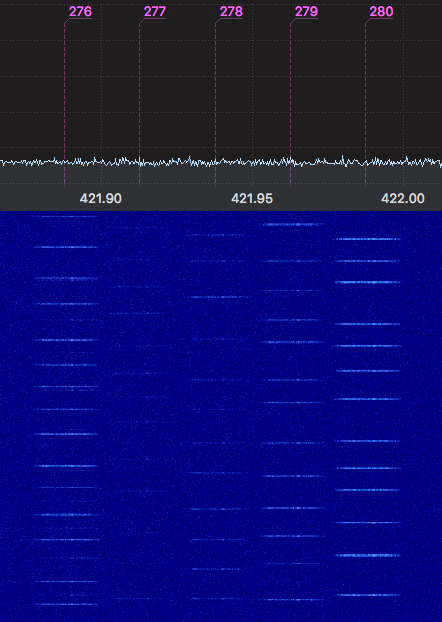 Minus1 have you tried decoding them with SDR# (there is now a simple TETRA plugin available: https://www.rtl-sdr.com/tetra-decoder-p ... available/). I'm guessing you might need to get out and about, as the SNR looks poor from your waterfall pictures. FYI, I've had a hunt (Bristol area) and found nothing other than previously known TETRA carriers. Are MOD/RAF Police in that band? I think their on-site comms are near 410mhz, but their TETRA comms are on Airwave. Eh? Airwave is just the UK branding of their radio system that uses the TETRA protocol, that's all. I don't understand your point G4RMT. To clarify re thelads question, the MOD/RAF Police's TETRA radios are on the Airwave network so they will be found in the ESN band reserved for Airwave (380-395 MHz and 390-395). Their on-site comms (analogue or P25) are in the 410Mhz part of the spectrum (usually 400-410Mhz). That makes them unlikely users of this freq pair 421.9 and 411.9 - more likely to be civilian. I have 421.9125 paired with 411.9125 as "Spectrum Access (Crown Recognised Spectrum Access)", allocated to "The Secretary of State for Health". Licence number 0799272, taken from the old style OFCOM WTR. Other allocations in this area are for "Airwave Solutions Ltd." & "The Secretary of State for Defence". The more I look at the plots, the less I think these are TETRA. If it were a pair, then I'd expect the the 421.900 Freq to be a constant carrier Downlink frequency. The uplink frequency would be virtually impossible to detect unless you were sat on top of he transmitter. Yet the two plots are almost exactly the same. Some i'm guessing it'a more likely to be one of the manhy non-TETRA data signals.